Auckland Museum staff working with Sarjeant Gallery Curator of Collections Jennifer Taylor Moore to move the crated painting into storage. Conservation treatment of the Sarjeant Gallery’s largest painting, The Flight into Egypt by Frederick Goodall, dated 1884, is now complete. The painting, which at 2.6 metres high by over 4 metres wide is one of the largest framed paintings in New Zealand, had been on continuous display since the opening of the Sarjeant Gallery in 1919 and was in dire need of conservation treatment. In 2015 the painting was removed from the rear stairwell, the stretched canvas was separated from its frame, and both parts were crated. 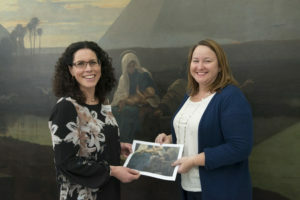 Following a successful application to the Stout Trust for funding, the painting was transported to Auckland Art Gallery to begin treatment in January 2017. The frame was sent to Manawatū Museum Services for treatment as the unique Egyptian gilded decoration which was cracking and lifting. The frame treatment is progressing well and will take nearly two years to complete. Sarjeant Gallery Curator of Collections Jennifer Taylor Moore (left) with Auckland Art Gallery Painting Conservator Ingrid Ford in front of ‘The Flight into Egypt’ by Frederick Goodall. Ingrid Ford, painting conservator at the Auckland Art Gallery Conservation Research Centre, was responsible for managing the treatment of the painting. This included stabilising the paint, which was cracking and flaking from the surface, strengthening the canvas support edges, and cleaning. While Ingrid’s team are experienced in working with large paintings, the massive scale of this work did pose some tricky difficulties with accessing the centre of the painting where the flaking paint was most prevalent. She commented that the painting is the second largest she has worked on and required six staff to move it during the treatment. When researching the painting prior to the conservation treatment, Frederick Goodall’s memoirs, dated 1902, came to light. These mention an event that may have been a contributing factor in the deterioration of the painting. Goodall describes returning to his London home after a visit to the National Gallery “in company with the Old Masters.” to find his house filled with firemen and deluged with water. After treatment the painting shows little sign of the ravages of time and historic water damage. 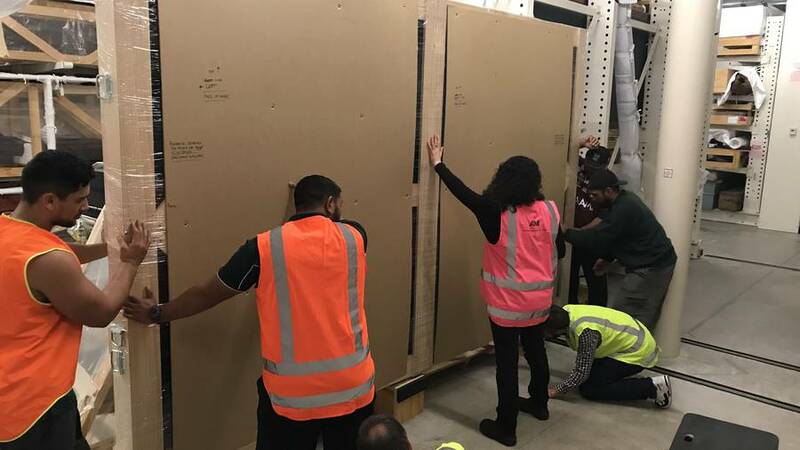 The painting, which is too large to enter the Sarjeant Gallery’s temporary premises at Sarjeant on the Quay, is currently in storage at Auckland Museum until the Sarjeant Gallery redevelopment is complete. The Sarjeant Gallery would like to thank the Stout Trust for making this significant project possible as well as Auckland Art Gallery and Auckland Museum for their continued support.